StormMeister® manufacture the world’s only hydrodynamic flood doors equipped with patented Active Flood Seals designed to work with the power of flood water rather than against it. Using the power of water ensures StormMeister® products are easy to operate for everyone including the elderly and infirm. At StormMeister® we are proud of our products and proud of our unique culture of continuous innovation which ensures we remain World Leaders in Flood Protection Products. 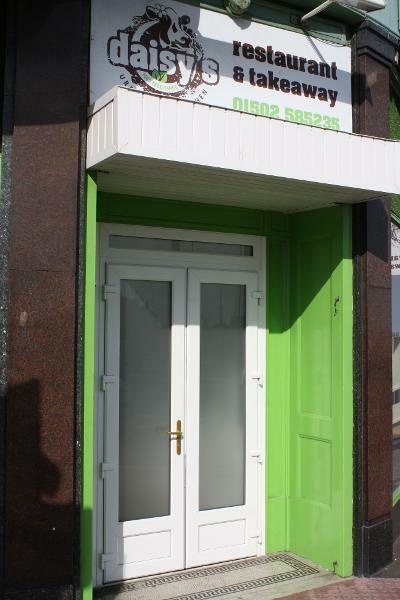 Conventional Flood Doors rely on handle applied compression to keep out the water, this means that in order to be effective the doors need to be tightly locked making handle operation extremely difficult. Another problem with conventional flood doors is they are effectively only sealed around the bottom so there is a big problem with rainwater ingress higher up the door. StormMeister™ Flood Doors are fitted with the Patented StormMeister™ Active Flood Seal all the way around the door which only allows enough water to pass to activate the Active Flood Seal. Consequently StormMeister Flood doors don't need to be on a tight setting and are therefore much easier to operate than conventional flood doors, the StormMeister door is by far the most user friendly flood door on the market. Easy operation also means less wear and tear on locking systems and seals. In conjunction with the StormMeister Annual Care Plan StormMeister™ Flood Doors are covered by the flood industry's only GGFi INSURED 10 YEAR WARRANTY, much longer than conventional flood door warranties! 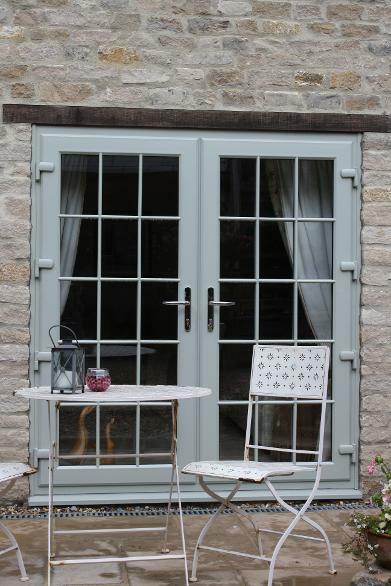 Our standard order to installation time is 8 to 10 weeks, more urgent cases can be considered individually. If you are buying flood protection products it's important to know whether or not those specific products have been tested. 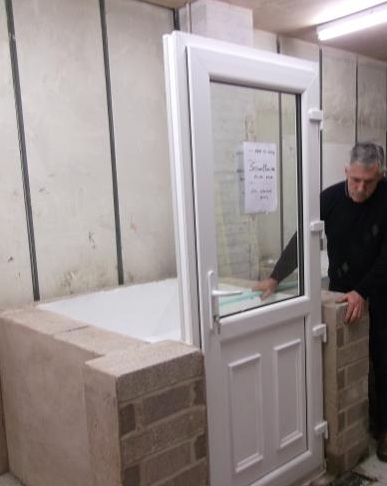 At StormMeister™ we test all of our products, flood barriers, flood gates, single flood doors, double flood doors, standard threshold, low threshold, inward opening, outward opening, smooth finish, woodgrain finish, you name it we test it! Not many companies test all their products and even less test woodgrain finish flood doors because woodgrain is a lot more difficult to flood seal. No problem for the StormMeister™ PATENTED Active Flood Seal. Come and see for yourself we have StormMeister™ flood doors on display in our testing tanks! Visit our product testing centre to see our flood doors working in fast flowing water, no other flood company makes such an offer! Complies with UK Building Regulations 'Part M' for wheelchair access and essential for all 'At Risk' commercial installations such as shops, bars, hotels and restaurants. Low-Threshold Disabled Access Flood Doors now available from the extensive range of StormMeister™ Hydro-Dynamic Flood Protection Products. 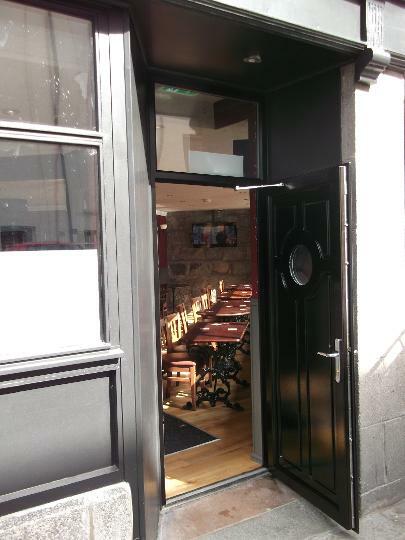 Initially designed and developed by StormMeister™ for properties in Aberdeen, Scotland these Low Threshold Disabled Access Flood Doors are required to pass the StormMeister™ exacting standard of zero leakage to flood water heights of 600mm and to provide flood resistance well beyond that level under test conditions. StormMeister™ flood doors come with a variety of locking options including push pad and electronic operation. 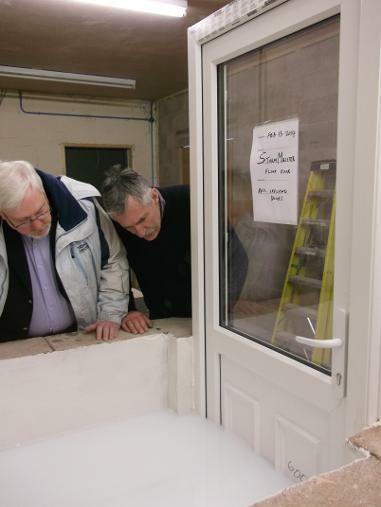 Contact Us to visit our testing facility to see the new Wheelchair Friendly Low-Threshold flood doors in action! Low Threshold Disabled Access Flood Doors. 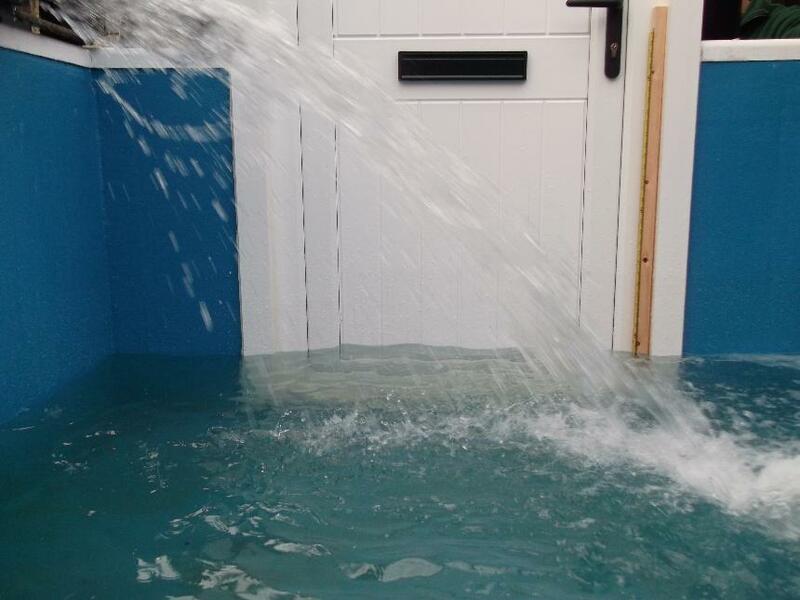 StormMeister™ Flood Doors and Flood Barriers are tested by deluging with water in realistic flood situations, under test conditions maintaining leak free protection for over 48 hours, far in excess of the requirements of PAS1188-1:2014 the industry standard for flood doors. 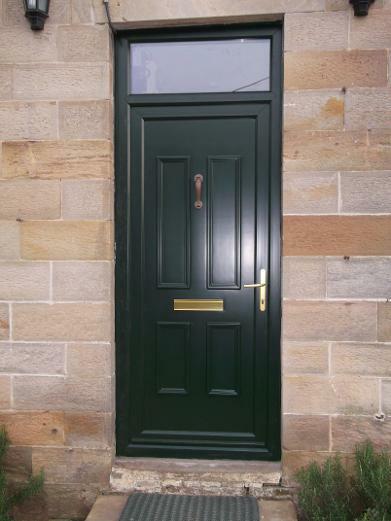 'Yorkshire Dales' Dark Green Flood Door pictured above, protection from flooding with a traditional cottage look.. Zero leakage of water at 600 mm demonstrated under test conditions! Climate change and increasing urban development have resulted in more and more homes becoming at risk of flooding. In the United Kingdom there are approximately 5 Million Homes At Risk, of which 1 Million Homes are at Severe Risk Of Flooding. Owners of at risk homes are increasingly under pressure from insurance companies demanding higher and higher premiums, and where homes are at severe risk of flooding many insurance companies will not provide cover. If your home is at risk of flooding sitting back and doing nothing isn't really an option, there are many things that can be done and fitting flood protection products including flood doors is probably the best in terms of peace of mind and reduced insurance premiums. StormMeister™ The ONLY Flood Door with a floodwater activated Active Flood Seal! 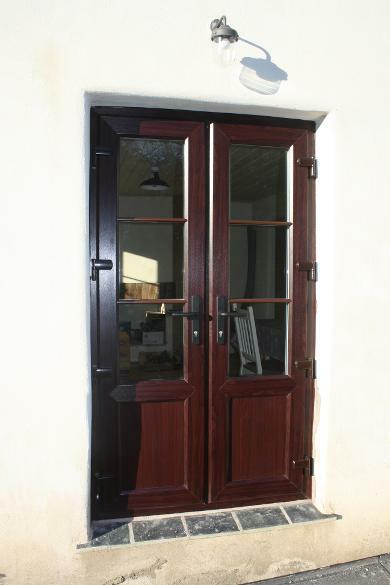 StormMeister™ Flood Doors are manufactured to ISO9002 the internationally recognised standard of excellence. 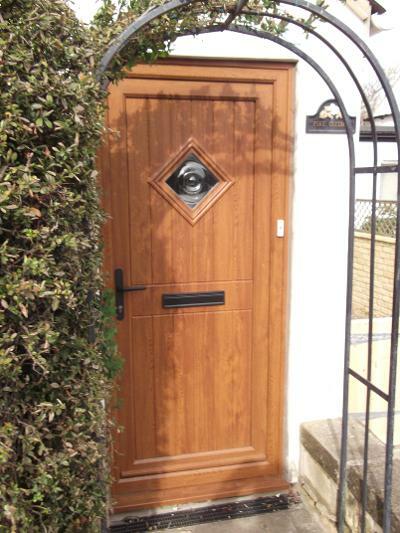 Used by major clients such as The Environment Agency for Flood Defence Schemes throughout the United Kingdom and exported World-Wide the StormMeister™ Flood Protection Door provides an automatic flood resistant seal for peace of mind every time you close the door. StormMeister™ Flood Doors are available in white, various wood-grain effects (which helps to save the rain forests), and a selection of factory applied colours. 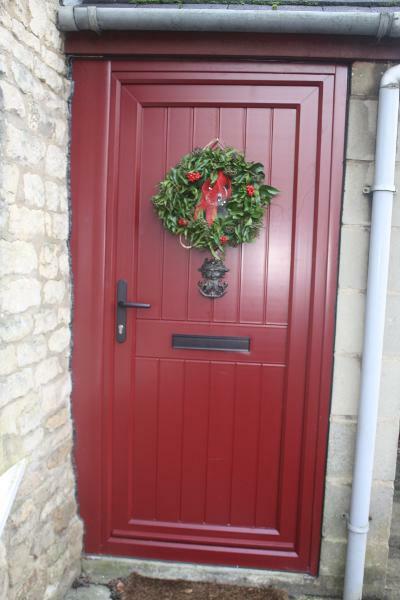 These functional but attractive flood doors are the beauties with the hidden assets, specially formulated Impact Resistant Plastics, Galvanised Steel Reinforcing and a unique Patented Active Flood Seal™ which means StormMeister Flood Doors out-perform any other flood door on the market! To arrange a FREE QUOTATION WITHOUT OBLIGATION phone 01772 704429. StormMeister™ professionally qualified Flood Door Installation Engineers carry out flood door installations and after-sales service throughout the United Kingdom. The time from order to installation is normally eight to ten weeks (consideration will be given to more urgent cases) and payment can be made by debit or credit card. StormMeister™ flood doors are available in white, any RAL colour, and a wide variety of wood grain effects. Active Flood Seal Protection, Zero Leakage at 600 mm demonstrated under test conditions. StormMeister™ Flood Protection Doors, the only flood door fitted with an active flood sealing mechanism maintained by pressure of flood water. UK Patent GB2525382, Worldwide Copyright, Patents and Patent Applications. 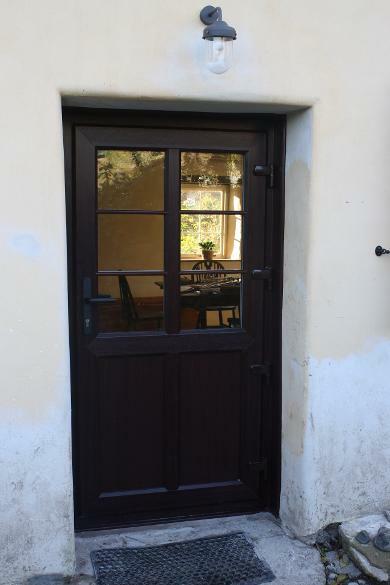 Conventional flood doors use passive seals which rely on handle pressure to resist rising flood water and consequently are difficult to operate and expensive to maintain. StormMeister™ flood doors are completely different and utilize water pressure in their unique active flood sealing mechanism that maintains flood resistance long after passive seals have failed. StormMeister™ Flood Protection Doors exceed the PAS 1188-1:2014 48 Hour Test, the industry standard by some considerable margin, testing at our product testing facility in Preston demonstrates zero leakage at 600 mm flood height for periods in excess of 48 hours and ongoing flood resistance to heights well beyond that. GGFi INSURED TEN YEAR WARRANTY. We will be competitive at all times for all our flood door, flood gate, flood shutter, and flood barrier products but we will never compromise on quality or performance always exceeding industry standards by a long way. To arrange a FREE quotation click on our contact page with details of your requirements. Contact us now! STOP water from getting under the floorboards! 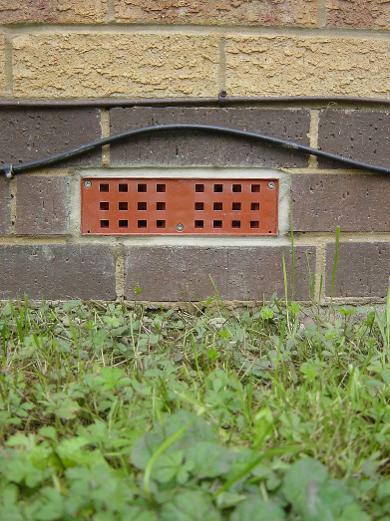 Pictured below is a StormMeister™ self sealing SmartBrick, the airbrick that seals automatically as the flood water rises. We have years of experience designing, manufacturing, and fitting flood doors and specialized flood products of all kinds. 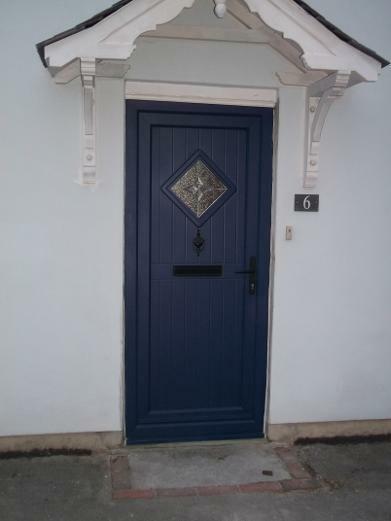 Our flood door installation engineers are professionally qualified and every StormMeister™ flood door is manufactured to the International Standard Of Excellence ISO9002. We only use Impact Resistant Plastics tested to BS EN12608 under the most extremes of temperature. All surveys are carried out by professionally qualified surveyors and as members of the Safe Trader Scheme you are absolutely guaranteed no high pressure sales tactics. We will work within your budget constraints, we guarantee to always provide best value, AND we guarantee to stay on the job until it's done to your satisfaction.